When asked to reveal their influences, builders can come up with some pretty odd answers. But I don’t think I’ve ever seen “a wood-burning stove” credited before. ‘Moon’ comes from Thrive Motorcycle of Jakarta, and they have an unusual method for finding out what their customers like. Putra Agung explains: “We asked the client, ‘What’s on your mind right now?’ and he answered, ‘A wood-burning stove.’” The stove in question turned out to be a Mendip Loxton, an angular English creation usually finished in a dark charcoal enamel. Wood-burning stoves are not common in Indonesia. After all, temperatures rarely drop beneath 25°C (77°F). 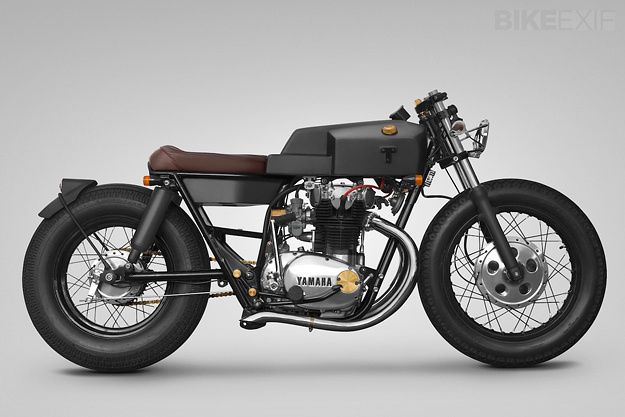 But that stove became the inspiration for this build, which is based a Yamaha XS650. Given the rarity of larger-capacity bikes in Indonesia, obtaining and customizing an XS650 is no mean feat in itself: It took almost a year to locate the bike. But Thrive’s lead builder, Barata Dwiputra, completed the transformation inside two months, including a complete engine overhaul and hand-fabricated bodywork. 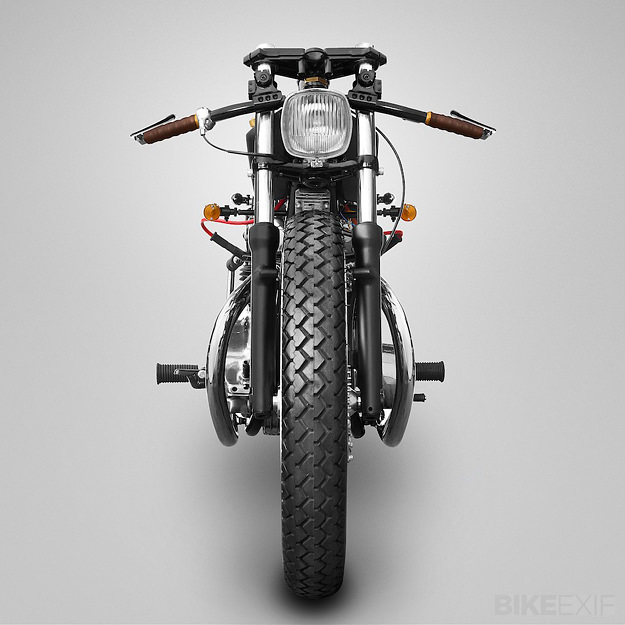 Thrive wanted an aggressive look, so the wheelbase was lengthened via a custom swingarm, and the front end was lowered a little. The colors have been reduced to shades of black, with brass and copper accents for the details. 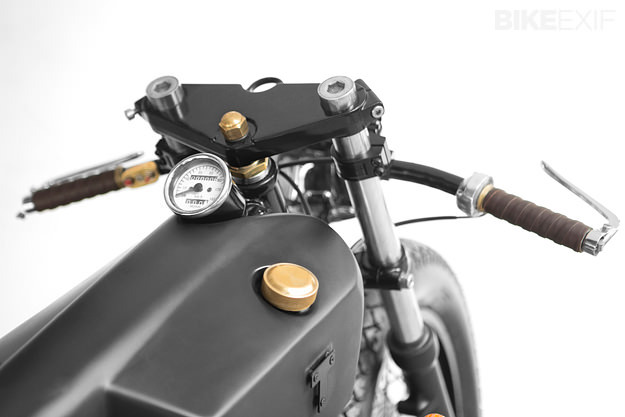 There’s a very elegant floating rear fender, and the shocks have been sleeved to simplify the detailing. 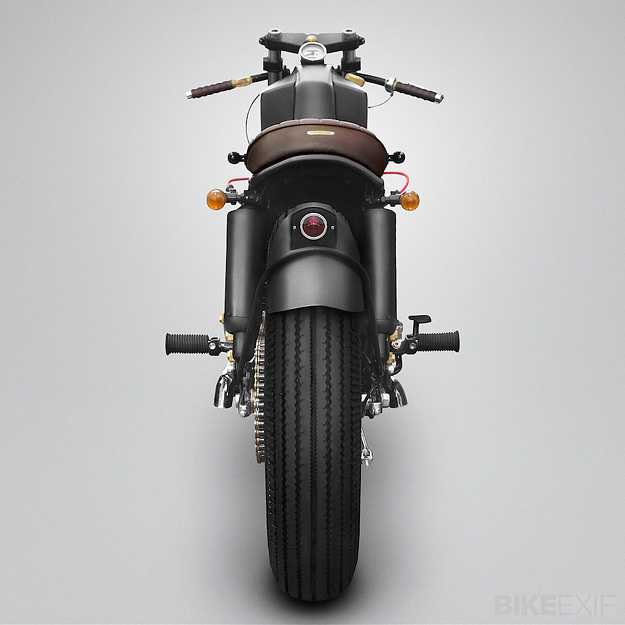 The wiring has been simplified too, and a square headlight adds to the angular look. The only curvaceous items are the simple straight-through exhaust pipes. 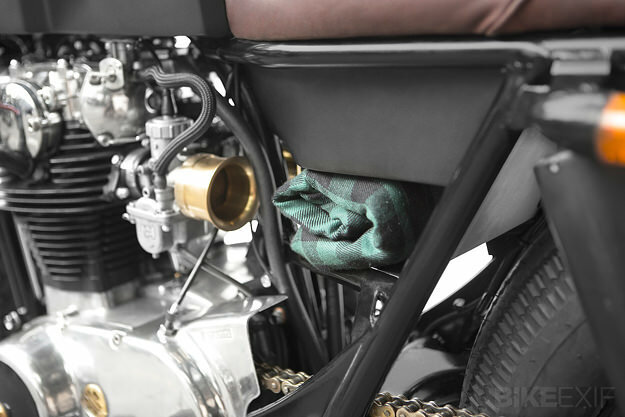 There are practical touches though, like a custom canvas bag containing every tool needed to maintain an XS650. And a pair of leather belts have been fitted under the battery box, designed to hold a flannel shirt or jacket in place. 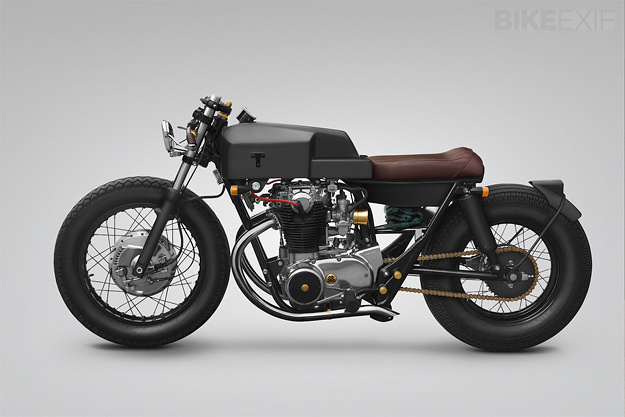 It’s a remarkably original build from a company with a strong and unusual aesthetic. Thrive does not have a website yet, but is on Instagram and Vimeo. Thrive’s work is also featured in the book The Ride: New Custom Motorcycles And Their Builders. Order your copy here.